Baseboard Cleaning Tool Makes Cleaning Your Baseboards Super Easy! Baseboard Cleaning Tool will be your new best buddy! This tool makes cleaning baseboards super easy! 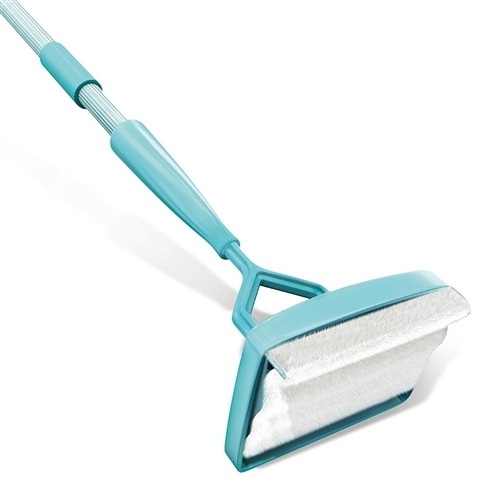 Baseboard Cleaning Tool's adjustable handle means you don't have to get down on your knees to scrub your baseboards. Extend the handle to the desired length to easily reach crown molding and door casings too. With the flexible head design, Baseboard Cleaning Tool conforms to your baseboards and moldings and won't scratch or chip the paint. With a 360 degrees swivel feature so you can access any angle you need for a thorough clean just about anywhere- behind furniture, appliances, fixtures, toilets, and more. The collapsible handle makes for easy storage. The cleaning pad is reusable, simply rinse and dry. May be used wet or dry. Each set includes 1 Baseboard Cleaning Tool extendable microfiber duster and 2 cleaning pads.